Here is a premium class product (actually made in the ultra-modern SEAT factory outside Barcelona though maintaining the high quality standards that is the Audi hall-mark) that proved to have impressive competence in these conditions yet had the road driving performance qualities of an immensely competent medium-sized hatch back. Yes, two idiots barged down hill in that snow forcing me to stop and though irritating it proved that the traction provided by the Quattro all-drive system and the grip from the Continental tyres on the optionally larger 18inch alloy wheels were able to regain traction. It feels an easy driving and safe machine (it has a 5-star NCAP safety rating) and has plenty to offer the discerning driver with one eye on the budget. Top speed is in the 132+ mph region with 60 mph reached from rest in a shade under 8.5 seconds which are good figures for a car of this size/weight and with a combined fuel consumption of 42.9 mpg is sensible even if one gets a real world consumption figure of nearer to35mpg. As I expected when first driving the Q3 I found that the driving position has all the right adjustment facilities to ‘tailor’ a high degree of driver comfort suitable for hours of relaxed and tireless driving. Driver’s forward vision is better than average, rear wards is challenged by the high rear window though parking sensors and visual parking graphics combined with the satellite navigation on the test car complemented the large exterior mirror. Above all, the compact dimensions makes for easy parking access. Add to that a feel good factor provided by the business-like yet exquisitely finished fascia and instrument cluster that has clearly been designed to cope with a number of cost-extra options requiring fascia space without compromising the overall appearance. Higher ground clearance makes for a slightly loftier height although the interior height is average rather than generous and with seating space for five occupants the rear accommodation is passable both for head and leg space providing the occupants are none too tall. Luggage capacity at around 450+ litres with all seats in use is about that of an average boot on a medium sized car but with the 60/40 split, folding rear seats and the ski hatch the practicality is obvious. A metal threshold to the luggage area, incorporating a protective system to prevent the tail-gate catch snagging items when loading is a very sensible innovation, and the practical and logical oddments stowage facility around the car’s interior also indicated thoughtful planning. So here’s Audi’s first venture in the competitive so called SUV market and, believe you me, it has hit the ground running. 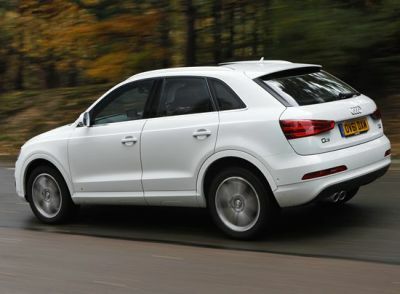 Rivals include: Toyota RAV 4, Kia Sportage, Ford Kuga, VW Tiguan 2.0 TDi, Land Rover Evoque.